Your dog gets her own Concierge! 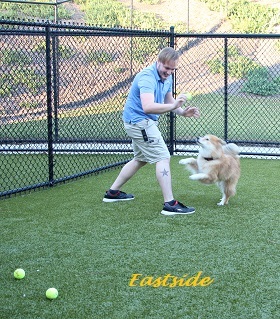 Offered exclusively at our Eastside location, Concierge Boarding is unlike anything Pawtropolis has ever offered. 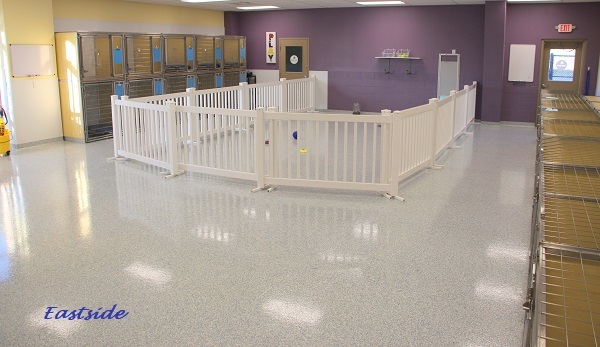 We are taking our individualized approach to pet care one step further by creating an area that allows us to more specifically address the needs of the dogs joining us in our Concierge room. Concierge rooms are rented in 4-hour blocks and one 12.5 hour block overnight (slight variations during the weekend). Each block of time comes with 1 activity perk that is designed with your dog in mind; examples: small group off-leash play, lazy lounging and snuggling, swim time, daycare play, a bath, a hair care, goodnight cuddles, puppy training, etc. 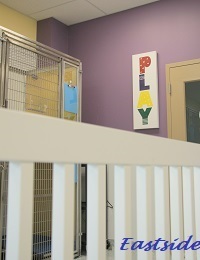 Only our top trained Playgroup Supervisors will be allowed to manage our Concierge room. 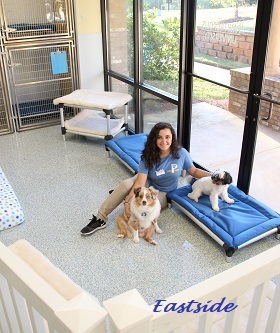 They will know how to identify the needs of each dog and make decisions throughout the day that will make for an enriching, stress-free stay for each and every dog. Dogs staying in Concierge will have an additional questionnaire for their owners to complete and, at pickup, pet parents will be provided with a detailed description of their pets stay and each activity perk provided. 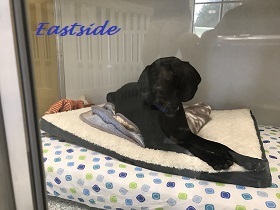 Quote from a happy Concierge client: "Eastside’s Pawtropolis’s Concierge Service is exactly what our dog needed. He is not able to be in the daycare playgroups. He is a very loving dog with people and with just a few dogs at a time, but a pack is too much for him. The concierge lets him play with one or two dogs at a time and have quality staff interaction. He gets plenty of exercise and is very relaxed when he gets home. We are so impressed with Pawtropolis’s ability to create a way for all dogs to have a fun day." Senior dogs: Senior dogs still may enjoy the social interaction of playgroups but physically they just can't keep up. Concierge would allow them to enjoy playgroups with less dogs or even room to lounge around on comfy beds with other less active dogs. 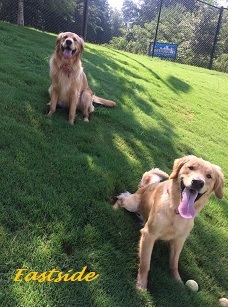 Puppies: We wish we could require all puppies attending daycare to participate solely in our Concierge Program. It's not healthy for puppies to play for hours on end. They also need more structure in their day to help encourage good potty habits. 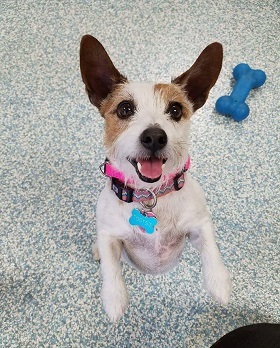 We've found that puppies that grow up coming to daycare several days a week become rowdier teenagers, and sometimes as they reach 1 year of age, begin to have dominance issues because they have taken"ownership" of playgroups. 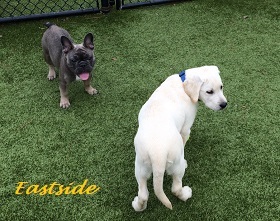 Having a structured day for puppies helps get them on the right start of a long happy relationship with daycare. Herding Breeds: Herding dogs can sometimes "lose their mind" in daycare. They become overstimulated by all the dogs and start behaving as if it's their job to keep the playgroups under control. They begin herding the other dogs by nipping dogs running by or referring when dogs start to wrestle. The also have the tendency to run the playgroup outside fences due to the stimulation of what's going on in other groups. Many amazing herders have been dismissed from playgroups simply because they are trying to help us do our job. Smaller groups would be ideal for great social play. Nervous/High Anxiety Dogs: Social groups are wonderful tools for helping shy and anxious dogs. However, the large number of dogs in our normal playgroups can sometimes be overwhelming, taking them longer to come out of their shell. A smaller, more controlled group will allow them the benefits of social play while building their confidence. The Truly Spoiled: Some owners may simply like the individualized care offered in Concierge better than our other options. 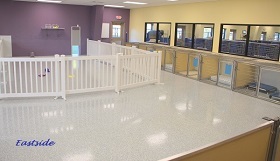 They'd rather entrust the choice of activities to the staff as they get to know their dog and their dog's needs. Hmmm, not sure how to label these guys: Some dogs can be quite the, umm, "challenge" when in daycare groups. They can do well with social play but only under the direct supervisor and guidance of an animal caretaker. Of course we supervise the groups 100% of the time, but these dogs need to be actively "managed" or they find themselves in trouble. If the staff had the ability to pair them with only appropriate playmates according to their needs, then a better time would be had by all. 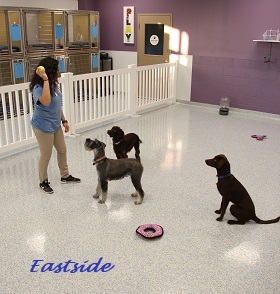 Many behavior problems that dogs experience in large group play can be managed and even trained when given more individualized structured play. Unneutered Males: We do not allow unaltered male dogs in playgroups after 7-months of age. However, I am well aware that most unaltered dogs have wonderful social manners. This allows them to get social play with appropriate friends that won't mind their manly status. *Peak-time stay minimums in affect for Concierge Boarding as well. Please see Pricing and Policy document. Email bark@pawtropolis.com or pick one up in person. 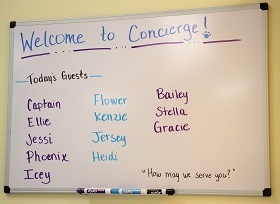 **Email us if you think your dog would be a good fit for our Concierge option. Pre-approval is required for this area.